Blue Max Generators require spare parts. Parts that are most often purchased include fuel filters, spark plugs, mufflers. What are the key components of a Blue Max Generator? Engine – Blue Max generator engines use fuel to produce rotational motion to produce electricity in the genset. Alternator – The alternator produces an electricity using the mechanical energy from the engine. Voltage Regulator – The voltage regulator allows the Blue Max generator to produce a proper voltage to power electrical devices. Starter – The Blue Max generator is started using either a recoil type pull starter coupled to the flywheel or using a starter motor powered by a battery. 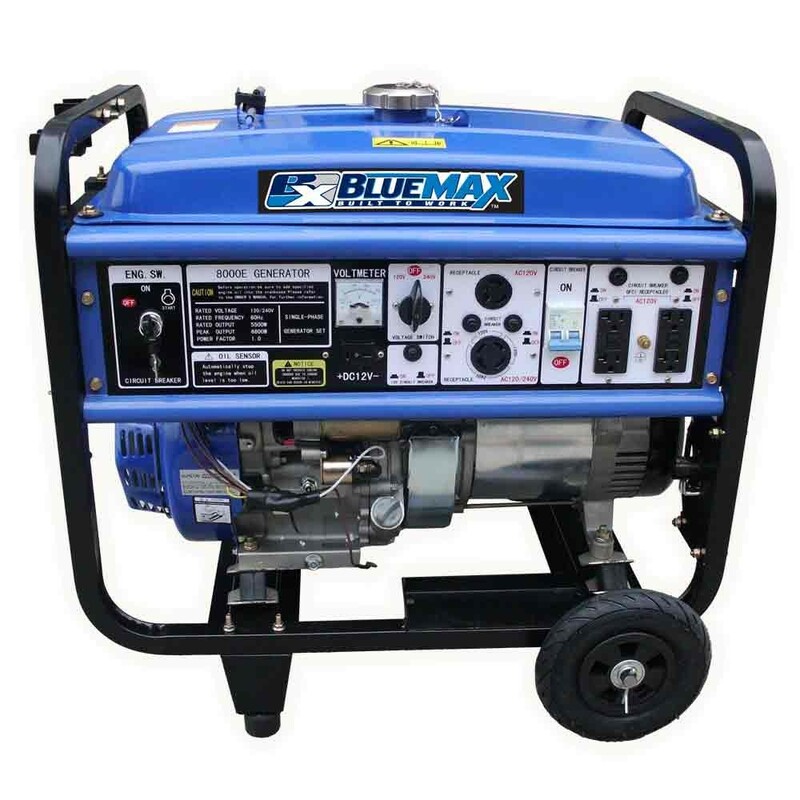 Battery – The Blue Max generator battery is used to start the engine in generators that have a starter. Hour Meter – The hour meter is device that measures the amount of time that the generator has been in use. Hour meters are important to determine when routine maintenance is needed. They are also a good tool to use in determining how much a generator has been used when it comes to evaluating used generators. Frame – The frame is the chassis which secures the engine, gas tank and alternator together. Often, in the case of larger portable generators, a wheel kit and a handle kit are used to make the generator more portable. Fuel – the fuel is either stored in a tank or plumbed to the generator in the case of a natural gas or propane generator. In the case of Blue Max gasoline generators, fuel is transferred from the fuel tank to the carburetor using a fuel pump.